Senior KTN journalist, Ben Kitili´s wife has just clocked 27 with his unborn baby and its all ´mapenzi yana run dunia´. Ben is known for his endless love for the Queen in his life and mother of his 2 children. He takes to social media, publicly expressing unfathomable love for his Le Wife Extraordinaire: Amine Mude is the lady behind Ben Kitili´s impressive health and she ever graces his social media pages. Amina Mude, is heavily expectant with their 2nd child, just months after witnessing their breath-taking Islam-themed wedding. The two might have had it rough from the public who do not yet seem to comprehend how two extreme religions could merge. However, this might have been the least of their concerns as they are focusing on bringing up one happy, healthy and beautiful family. Feedback Fans are all ´Congratulations´ and ´Happy Birthday´ on Kitili´s Instagram page and this is it: @benkitili happy sweet 16 to your wife bro @amina_mude next year she will be turning 17 lloyd_emmanuel The fan made a sweet joke out of the Instagram post. Happy happy birthday @amina_mude and surely love is a beautiful thing wakarimamw Beautiful. Lucky you bro欄 sababuariisi Congratulations bro michaelmicheni Happy birthday to her darlleydee And this one is busy harvesting in-laws: @benkitili nilikuambia anipee Siz yake mdogo we be in laws yawa. Happy birthday kwake anyway frank.ian Nzuri sana kaka. God bless you. smukangai We say Congratulations to the two love birds and babies. 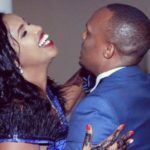 The post Love in abundance for Ben Kitili´s expectant wife, as she clocks only 27 appeared first on Ghafla! Kenya.